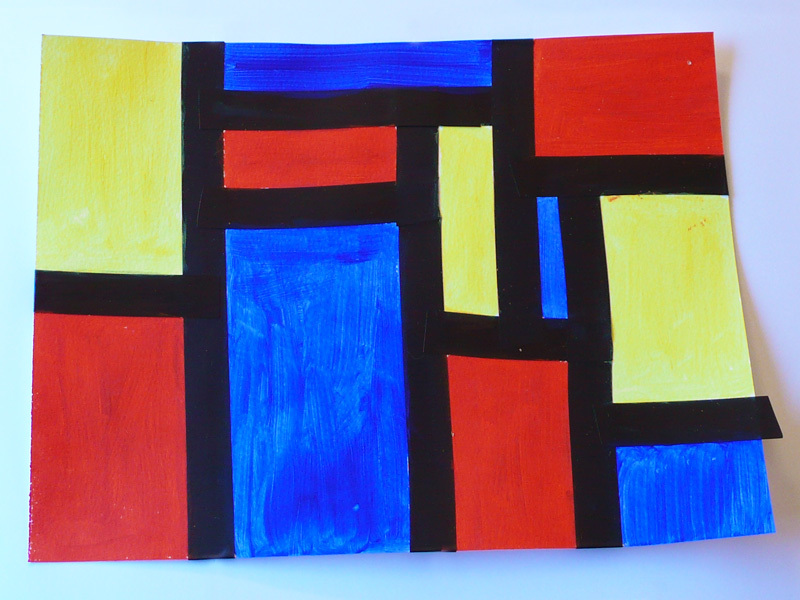 Teacher shows students pictures of Piet Mondrian’s art (you can find it easily on the internet). Tell them a little bit about him and the colours he used. Tell them that we will be using primary colours today. Students work in small groups, with 4-6 desks moved together, covered in newspaper. Put 4-6 (one for each) prepared papers at each group of desks. Students can choose which one they would like to do. Have them put their names on the back lightly in pencil, or, if you wish, on the front like a real artist. Paint an example piece of art to show them, not all shapes are filled in, two reds are not together, but there might be a red, then a blue, yellow and a white blank square, then a red up top, like Mondrian’s work. Tell students to take care not to paint on the black lines. If they do, they can use damp paper towels to wipe it off. Post students’ artwork on the bulletin board with a short description of Piet Mondrian, the man and a short description of his art. These artworks by the students WILL BE MASTERPIECES. They are so beautiful. My classes have received many compliments on their beautiful work. Click here to cancel reply to this comment. Copyright © 2010-2019 Lesson This!. All Rights Reserved.